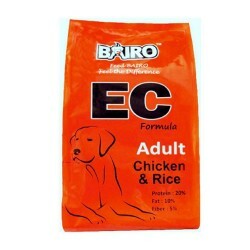 Product Details-Ingredients - Chicken meat meal (27,5%), rice (27%), maize, animal fat, dehydrated fish, dried whole eggs, hydrolyzed chicken liver, beet pulp, yeast, salt, refined fish oil, lecithin, fructo-oligosaccharides , Suitable-Adult Dogs, Quantity-3 Kg. Product Information-At Bairo we realise your intense passion for the pets and the importance of a healthy and nutritious diet for them. Therefore our team of nutritionists and veterinarians have ensured and created a superior quality food, specific to the growing needs of pets. Not just that, extensive research has also ensured a consistent taste, better digestibility and absorption across the products of Drools. These products are nutritionally balanced and undergo rigorous quality checks to ensure that the best quality of food reaches your pets bowl.While we aim at providing just the right balance of nutrients, the entire process from assessing the raw material to processing of Drools happens in-house, leading to a hygienic and consistent product that is highly recommended by Vets.